Here we are at the end of King Street, with the Old Kings School Shop on the right leaning into the street. Ahead is the Kings School Gate that leads into the rear of the Cathedral. 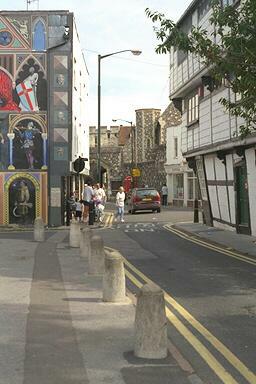 Turn left here to enter Knott's Lane and reach St.Radigund's Street that follows the old line of the city walls. The wall at the end here was once adorned with a mural, it's been expunged as it aged. But the Canterbury Tour can bring it to you as it was.